Leipzig – Sunshine. Whimsy. Tacos. I went to Leipzig on my way back from Dresden. 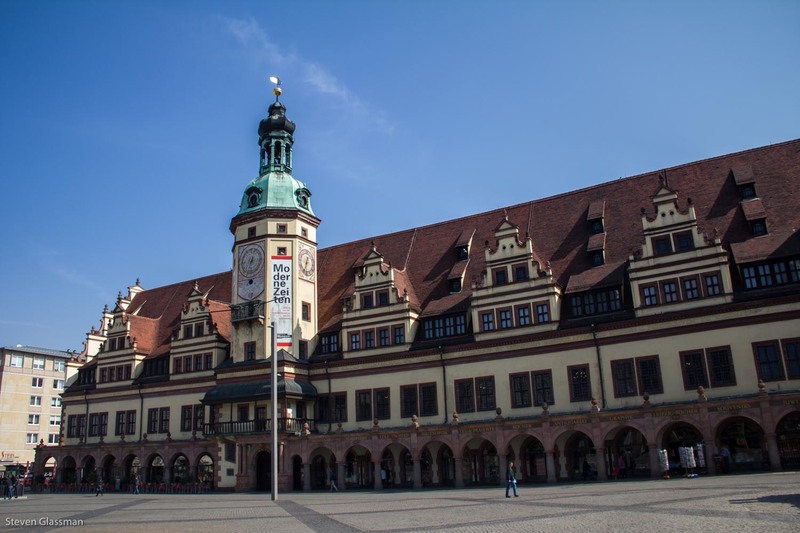 I didn’t stay overnight in Leipzig, I just took a few hours in between trains on the way back so I could see a bit of the city. My first order of business was taking the number 15 tram to the Völkerschlachtdenkmal, known in English as the Monument to the Battle of the Nations. This is a monument to commemorate Napoleon’s defeat at the 1813 Battle of Leipzig. I only wish I’d had better conditions for photography. The sun was behind the monument, which made getting a clear shot very difficult. 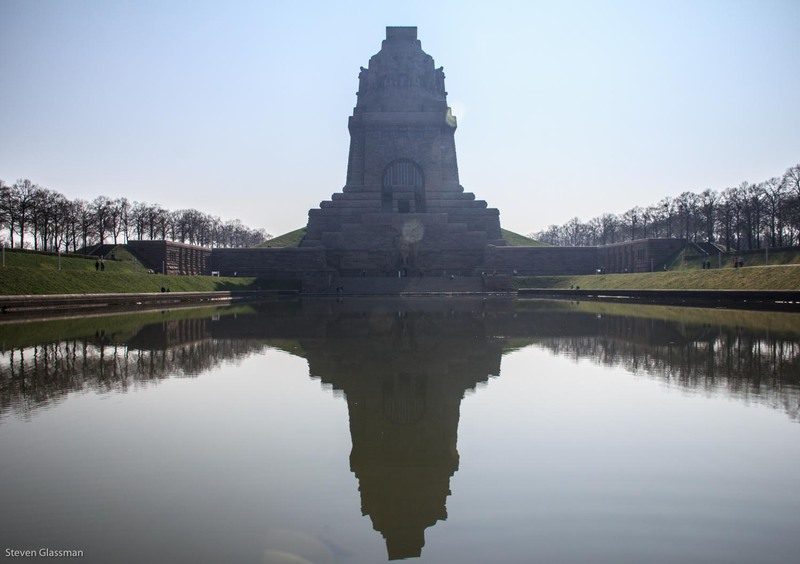 There are some really beautiful pictures of the Völkerschlachtdenkmal on the Internet. Mine isn’t one of them. Coming back into the center of town on the tram, I stopped by the Panorama Tower, seen on the left. 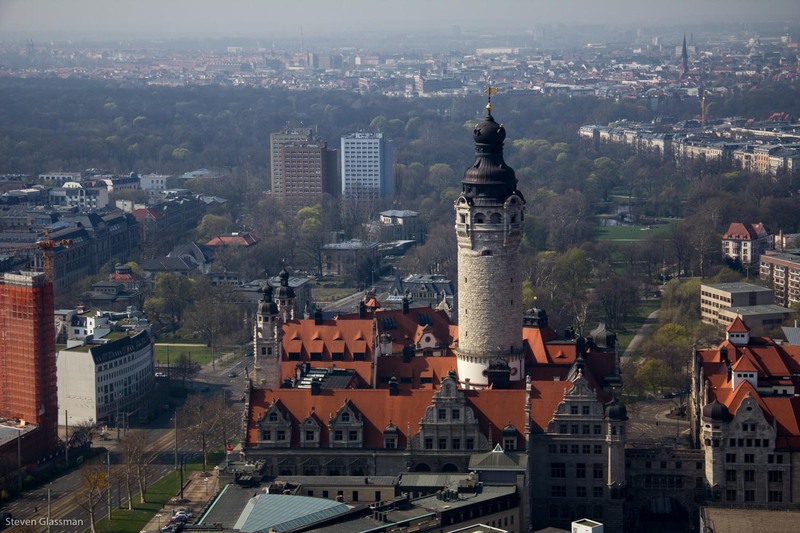 It’s the tallest point in Leipzig, and for three Euros, you can go to the observation level at the top. I was there on a really hazy day, but I still got a few nice shots from the top. The tall church visible in this photo is the Nikolaikirche (St. Nicholas Church). 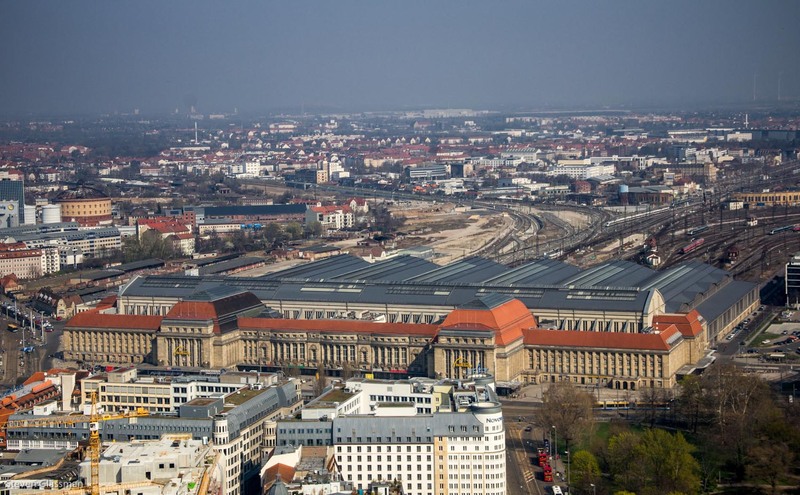 The Leipzig Hauptbahnhof is absolutely enormous. I noticed the size of it when I arrived, and thought that perhaps it was the largest I had seen. It turns out that I was correct- according to Wikipedia, the Leipzig main station is the world’s largest railway station measured by floor area. Here’s the outside, as seen from the Panorama Tower. 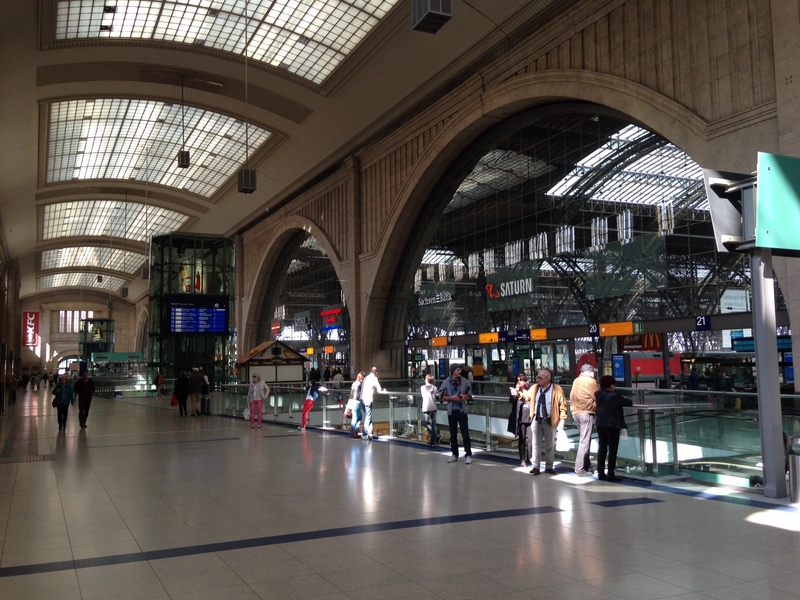 Here’s my attempt to capture the inside of the Leipzig station. It was simply too big for even a single photograph to capture. In every city I’ve ever visited, someone has been playing music for money. Leipzig was no exception. These next two photos are of statues inside the Auersbachs Keller Leipzig which were interesting to me. The statues face each other. The first depicts students bewitched by Mephisto. The second depicts Mephisto and Faust. Walking through the city, here’s Nikolaikirche up close. 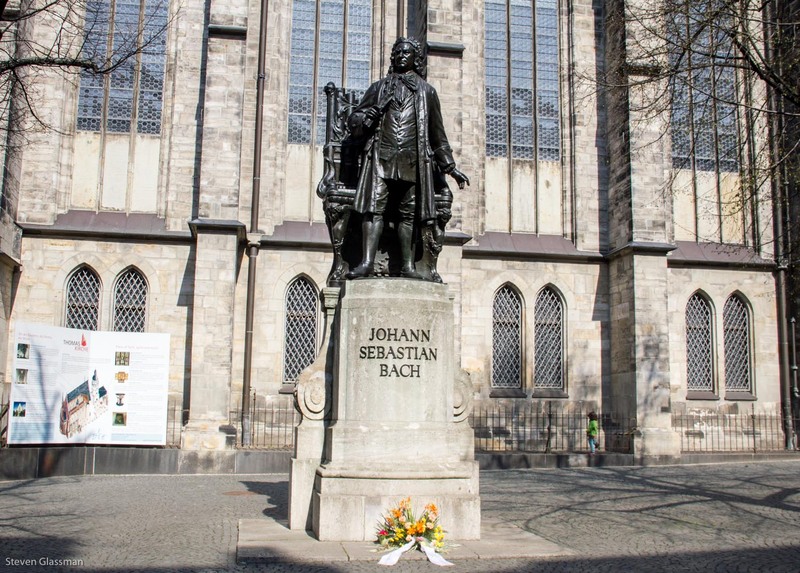 On the side of the Nikolaikirche, opposite the Bach museum, is a nice statue to Bach. Between Bach, Mozart, and Goethe, I’m collecting the whole set. I think this is the New Town Hall. Even if it isn’t, I liked the clock in this tower. Nice views, despite the haze! 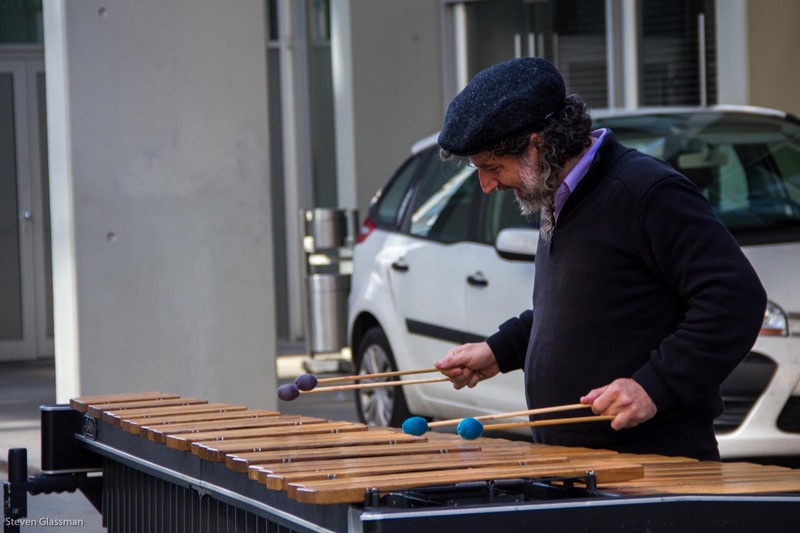 That xylophonist was playing the streets of Regensburg a few years ago in heavy rotation — haven’t seen him in a couple years though. I wonder if Leipzig is a more hospitable busking environment. We went to Leipzig on a whim (almost) with Lucid in Deutschland (a few months before she moved up to Flensburg) and a common friend from Sarah’s choir/orchestra. It was a great place to spend a weekend. 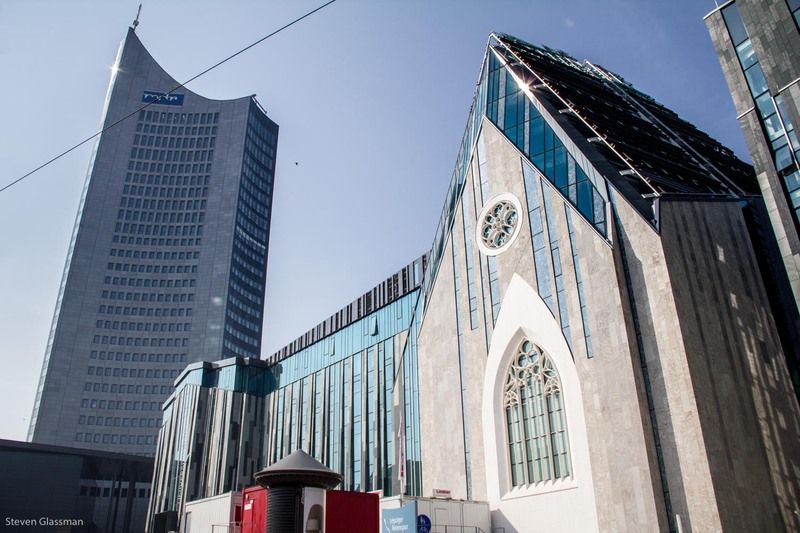 If you’re into the historical church music scene, Leipzig’s got lots on offer. The local beer variety was … interesting, to say the least. They’re big on “Gose” there: salty and sour. Definitely a change of pace compared to the Hefeweizen and Helles varieties in our part of the country. Oh, it looks really nice! 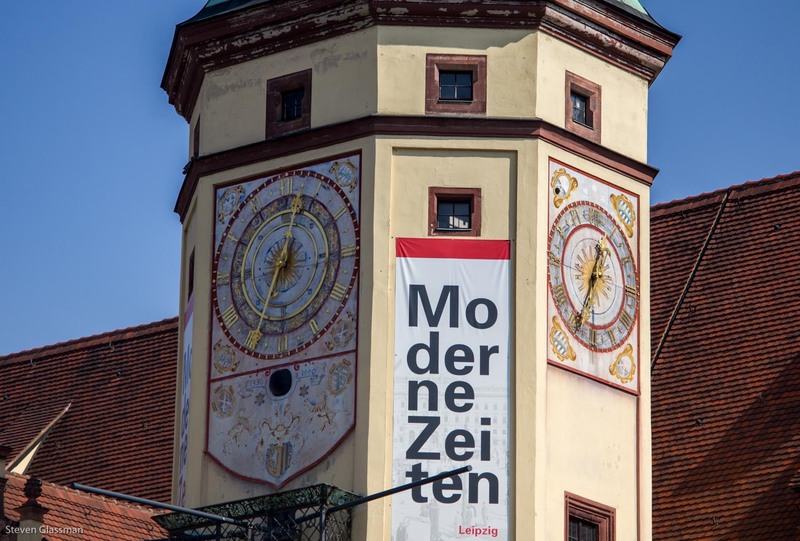 I’ve never been to Leipzig, but I want to. 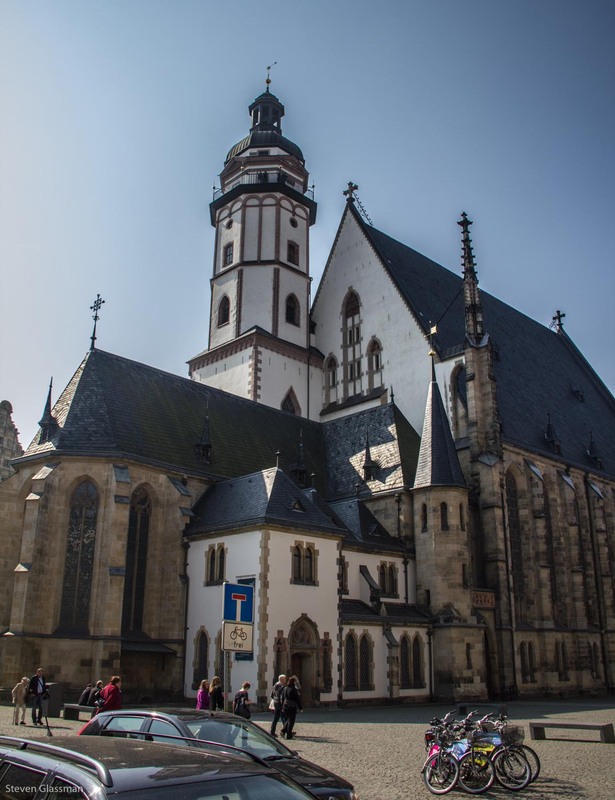 The Nikolaikirche is probably one of the most important places in recent German history. In autumn 1989 it was the location of the peaceful revolution that finally lead to the fall of the Berlin Wall and the reunification of Germany. it started in Leipzig, not in Berlin. 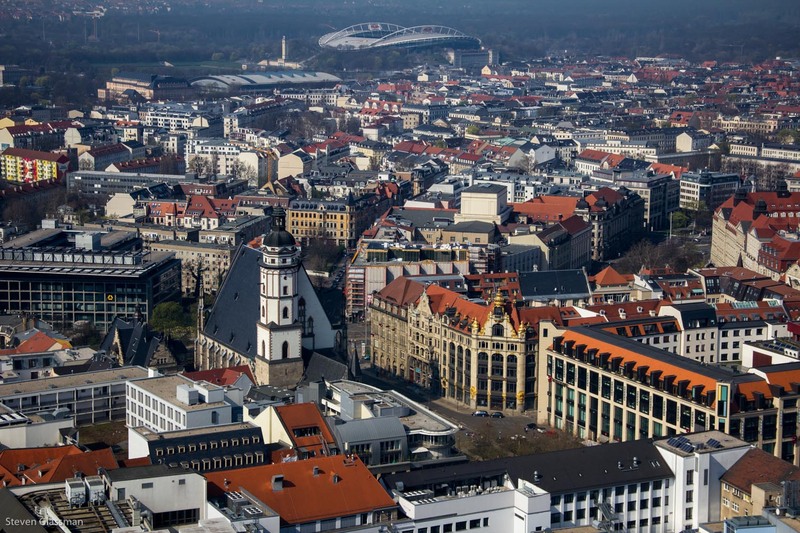 I love Leipzig – especially the beautiful Wilhelminian neighbourhoods. correction (sorry):… location OF ORIGIN of the …. 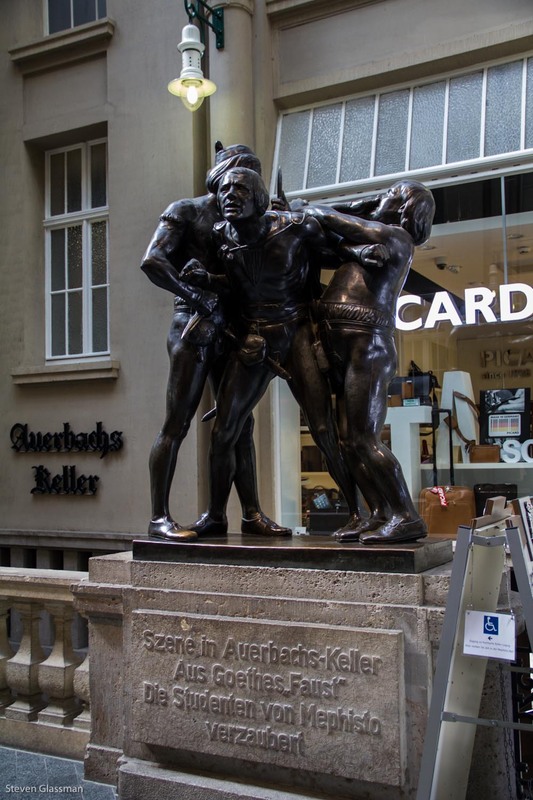 I think the Auerbachs Keller is the restaurant/bar that is mentioned in Faust, but I’m not sure. 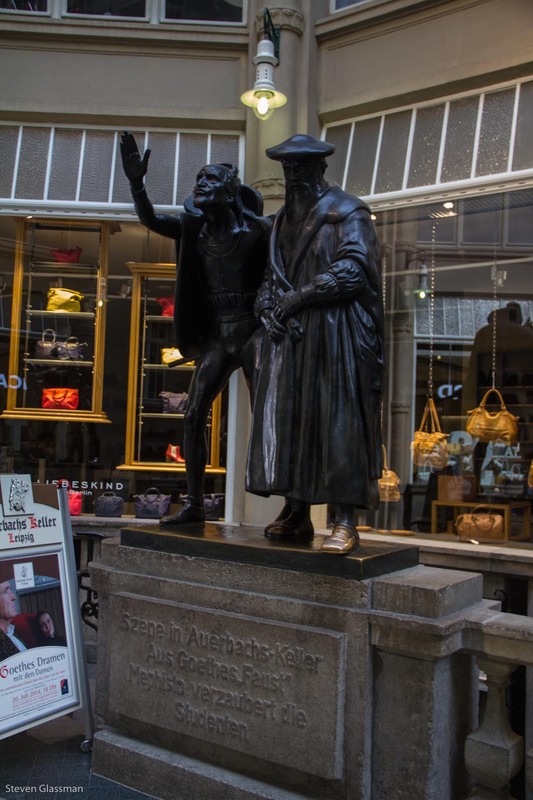 It would certainly explain the awesome, Faust-themed statues. 😉 If I’m right, that is beyond awesome. Neat! I hadn’t caught the history of the place.